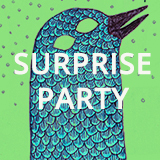 Want to get your hands dirty at Levigator Press? Here are four ways you can do so! 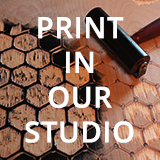 We now offer a studio membership programme for frequent printers; see this weblog post for details or contact the studio for more information. 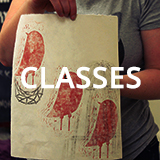 We offer one-time workshops and longer (2-5 week) classes in various printmaking methods,bookbinding techniques, and special projects. To find information on our classes please visit the Classes page. 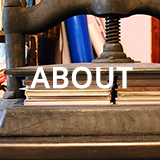 If you need instruction or just some hands-on press operator help for your print project, individuals or up to three people at a time can arrange for one-on-one private time. Private instruction must be booked in blocks of a minimum of two hours. Private instruction can be booked for any time during studio hours, 11-5 Tuesday through Saturday. Sessions outside these hours can be arranged for an additional fee. To discuss what you wish to learn and arrange for private instruction sessions please email Levigator Press. If you’re an experienced printmaker or someone who has taken enough classes or private instruction sessions with us to be proficient, we can offer you affordable, exclusive printing time on one of our presses during shop hours for your editioning and special print projects. Press rental sessions must be booked in blocks of a minimum of two hours, and setup and cleanup should be taken into account when booking your time. 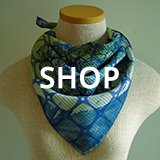 Studio rental can be booked to use the screenprint exposure unit and wash out area, the screenprinting table, the letterpress platen press, the proof press, the etching press, bindery equipment and book trimmer, and wood shop equipment. Please note that we cannot offer press rental during hours when a group class is running. 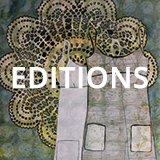 Levigator Press will be offering short residencies to printmakers and other artists interested in producing collaborative print editions with our studio. This programme isn’t quite ready to hit prime time yet, but you can email Levigator Press and ask to be added to our mailing list to be one of the first to hear about it once the programme applications are ready.